One of the most important responsibilities of a heavy equipment operator is conducting a machine inspection. Inspections not only ensure the operator’s own safety but also the safety of everyone else on the jobsite. A walkaround also keeps machines in good working condition so that production goals and deadlines can be met. For adding so much value, it’s interesting that walkaround inspections take only a few minutes. For example, when an operator finds a fluid leak, a loose hose fitting or some other problem before a failure, injuries can be avoided, downtime minimized and time and money saved. Operators should refer to the Operation & Maintenance Manual for diagrams and information on the particular machine being inspected. However, operators spend so much time with equipment that they know it better than anyone—almost intuitively. That’s why operators should engage their senses of sight, smell, sound and touch to reveal clues about the status of the machine. Check the machine before beginning a shift and again at the end of the shift. Make sure to conduct the inspection the same direction every time. If anything is different on the machine from the way it was at the start of the day, the information should be passed along to the next operator and this detail placed on the shift report. In addition to hands-on experience, technology can also bring value to operator training. Using Cat® simulators as part of an overall training program is an excellent way to develop operator skills. 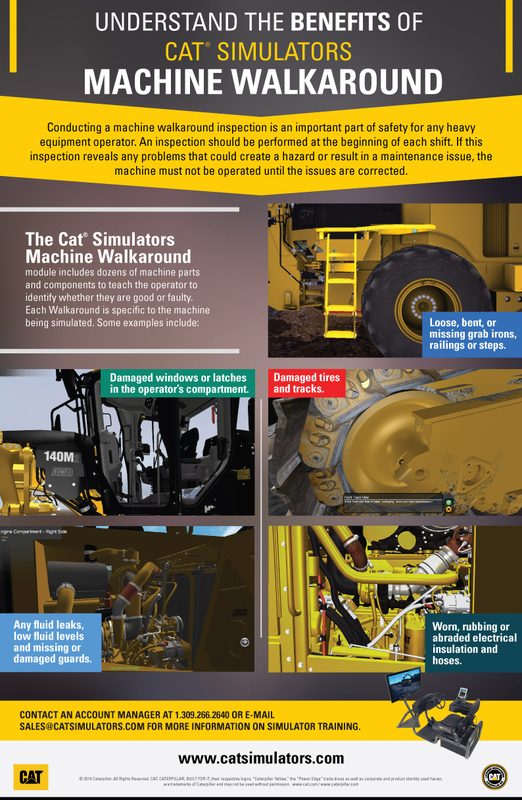 Cat simulators include a machine walkaround featuring dozens of fault points to train and test the operator before he runs the actual equipment.